Cathy Halinski and her husband Tom are those kinds of people. They lived in Chicago and moved to South Haven in 1996, living by the lake so that they could enjoy boating. They wanted to raise ducks, and then a horse, and the gated community they lived in prohibited it. So in 2000 they bought a 40-acre farm just east of where they lived, in Fennville, MI. That’s where the iconic goat arrived. While renovating their house, the carpenter left the door open and in wandered a goat. The dog chased the goat out and they took it out to the barn. No one claimed the old girl and one day she ran off. But a seed was planted and for Cathy’s next birthday, her husband bought her a goat which she named Bailey. Bailey lived for 12 years and was the matron of the herd which at one point reached 40 goats. Halinski started milking and breeding the goats, and eventually started making cheese. She studied with Margaret Morris of Glengarry Cheesemaking Inc. in Montreal, Canada, a sort of guru of cheesemaking, and studied at the Vermont Institute for Artisan Cheesemaking and came home to start producing Chevre and ricotta which she shared with her friends and family. In 2008 the small cheese factory was built and four years later, a tasting room. For a long time, the milk for the cheeses she started to produce and sell came from her own goat herd. “But raising goats takes a lot of infrastructure and work,” says Halinski. So last year, she began buying high protein goat milk from Tammy Tullar of Autumn Acres who breeds and raises goats in Dorr, Michigan. She now buys 250 gallons a week from Autumn Acres. She also purchases cow’s milk from MOO-nique Dairy Farm in Vandalia, Michigan. Halinski’s cheeses can be purchased online, and at the Holland Farmer’s Market. Or, one can visit the farm and have a tasting. The farm is now home to 15 goats, three cats, two dogs and a horse (the horse keeps predators away), along with a herd of heritage pigs. 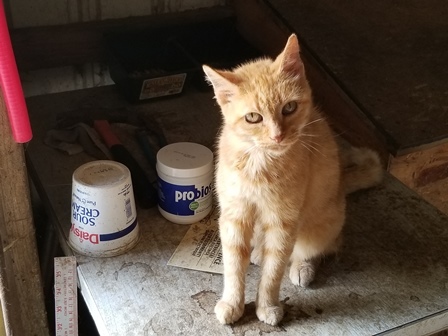 It is just the sort of farm you want to visit—goats and cats to pet, the horse peacefully grazing in the field, the dog running up to greet you. The Halinskis enjoy showing off their residents and telling their story, and of course, letting you sample Cathy’s cheeses. You can taste some cheeses for free, or have a formal tasting for $5. 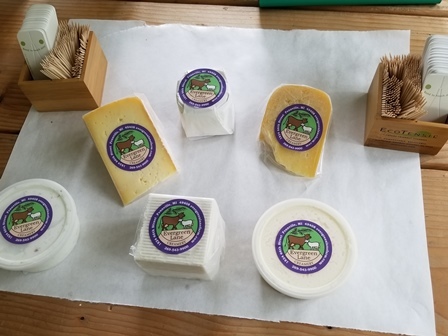 Ten cheeses are available, both goat and cow, both soft and hard cheeses for sampling and purchasing at the farm or may be purchased through the mail: Fresh Chevre ($7.50 for 6 oz. container), Pyramid Point ($22 per pound, a complex, ash-layered cheese), Poet’s Tomme ($22 per pound, aged cow cheese), Mattone ($22 per pound, Taleggio-style cow cheese), Tribute ($25 per pound, mixed goat and cow’s milk), April Showers ( $22 per pound, soft-ripened goat cheese similar to a Brie), La Mancha MOO ($25 per pound, Camembert-style cow’s milk cheese), Noella ($18 per pound, Alpine cow’s cheese good for melting), Lily Rose ($25 per pound, available Spring and Summer, a goat’s milk Camembert style cheese), and Farmer’s Feta ($15 per pound). It’s just the sort of farm visit side trip that makes the South Haven area so appealing. 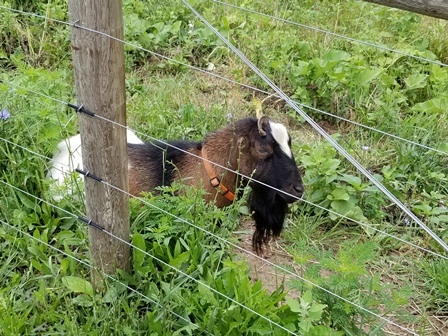 And did you know goats love to eat poison ivy? And did you know the name for a group of pigs depends on the animals' ages? A group of young pigs is called a drift, drove or litter. Groups of older pigs are called a sounder of swine, a team or passel of hogs or a singular of boars. Nancy Backas has been writing, mostly about food, for more than 30 years. South Haven is a favorite place, and she and her husband Terry visit as often as they can. The rich food and art culture, along with opportunities to explore South Haven's magical natural surroundings is what draws she and her husband to SoHa. She looks forward to sharing her South Haven discoveries. And, while they currently live in Chicago, with moving plans in the works, South Haven will soon be their new home.